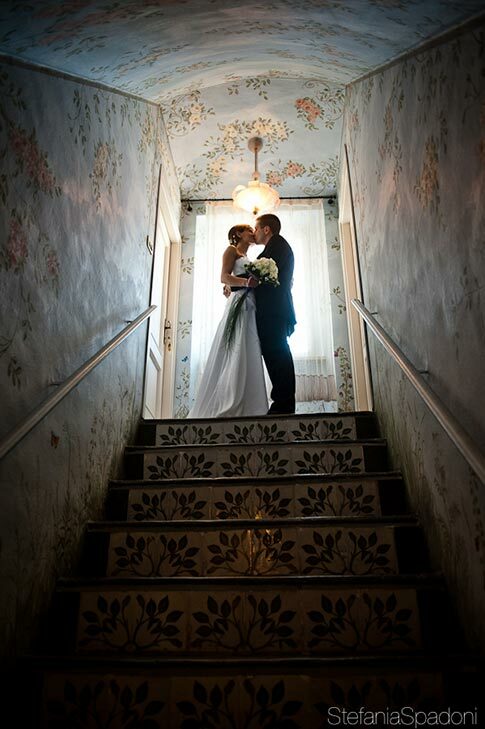 We are back to a wonderful villa we already told you about for Ivan and Stefania’s wedding. 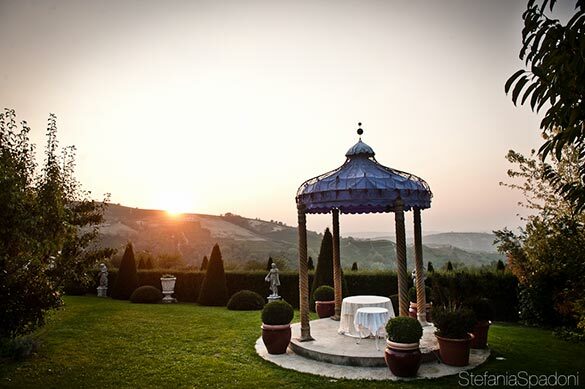 We can now say that this wonderful villa in Langhe is surely one of our top destination for a wedding in this area and offers all comforts you could ask for. 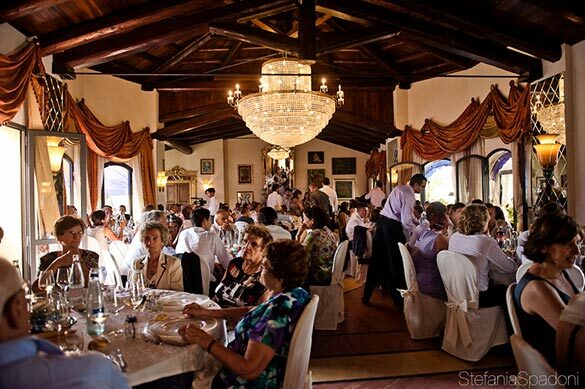 It is located in the heart of Langhe and owner Mrs Gabriella is the sweetest and kindest lady you could ever meet. 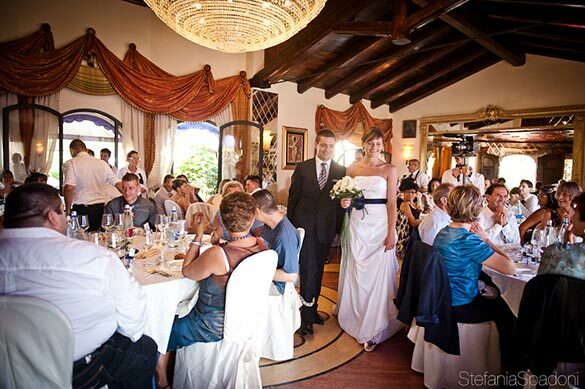 In this wonderful venue you could opt for a blessing in the garden as Jerri and Tom did or you could simply hire it for the reception as our Stefania and Ivan did. 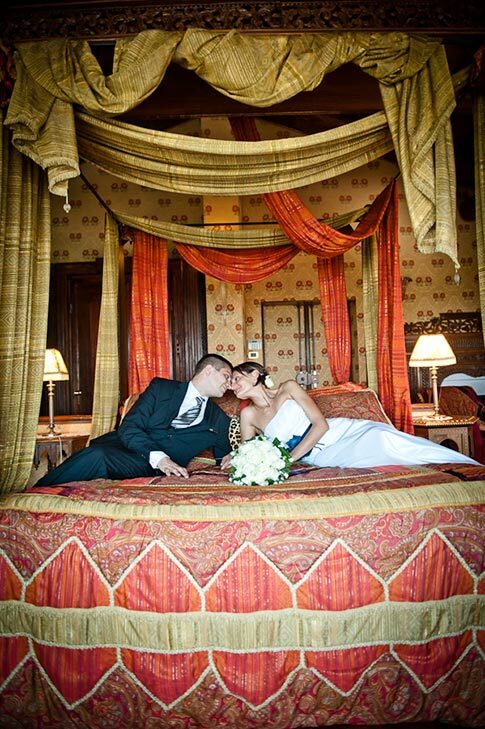 But you could also decide to rent all the rooms of the venue and stay overnight here with your family and friends as Alina Elena and Marco did. 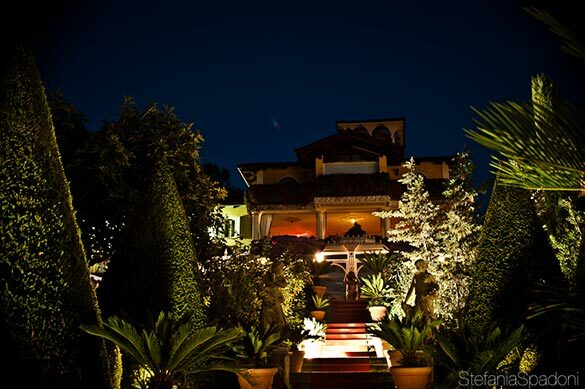 As the matter of fact the villa has 8 wonderful rooms. You can rent all of them for the week end or for a longer staying or just for the getting ready! The rooms have all a great view on Langhe vines. 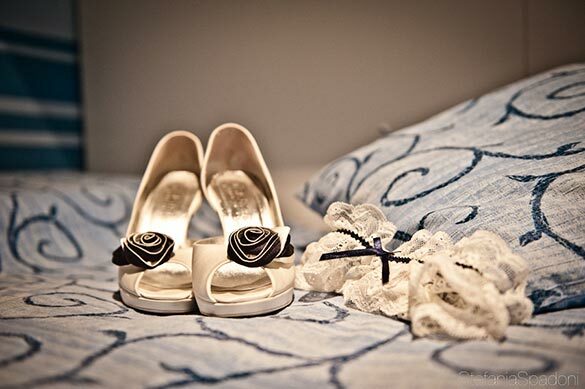 Mrs. Gabriella will put at your disposal the amazing swimming pool, gym and sauna and a delicious breakfast! 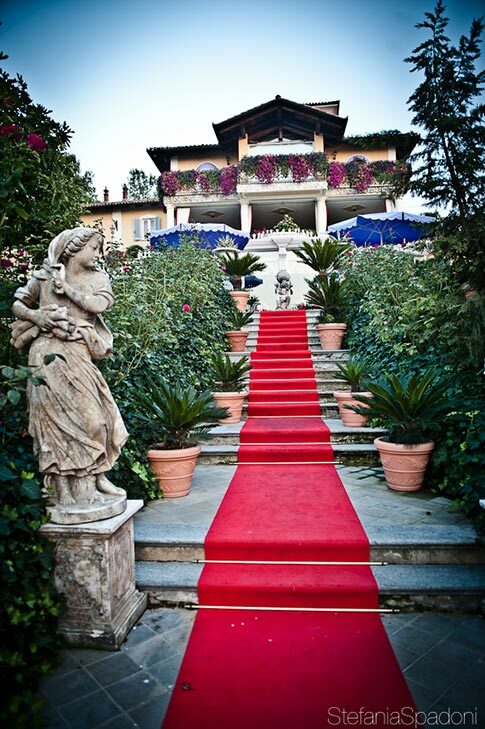 A dream vacation in Langhe! 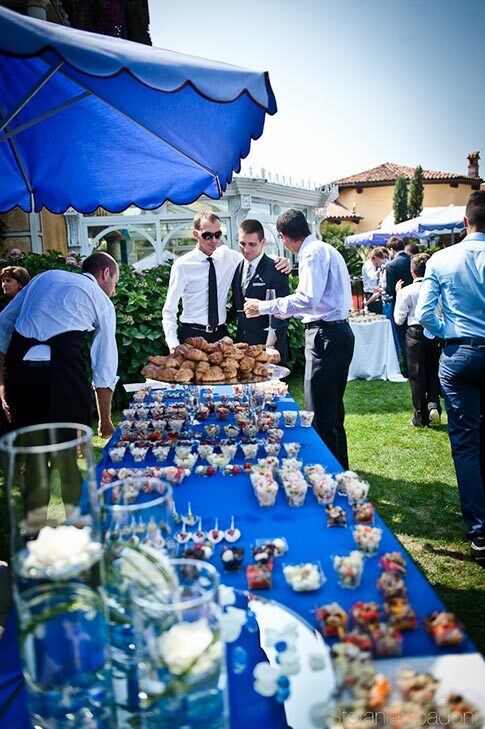 But let’s get back to Ivan and Stefania’s wedding! Stefania got ready at her home. 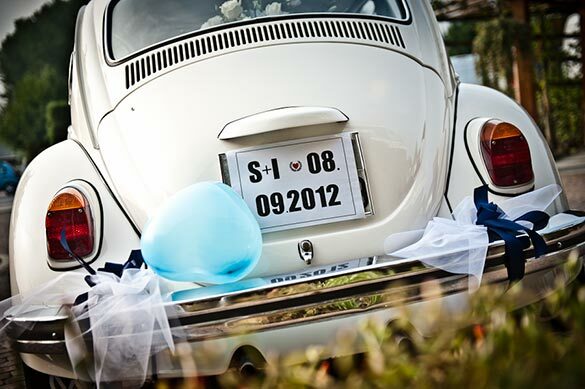 She wanted a blue themed wedding… something blue! 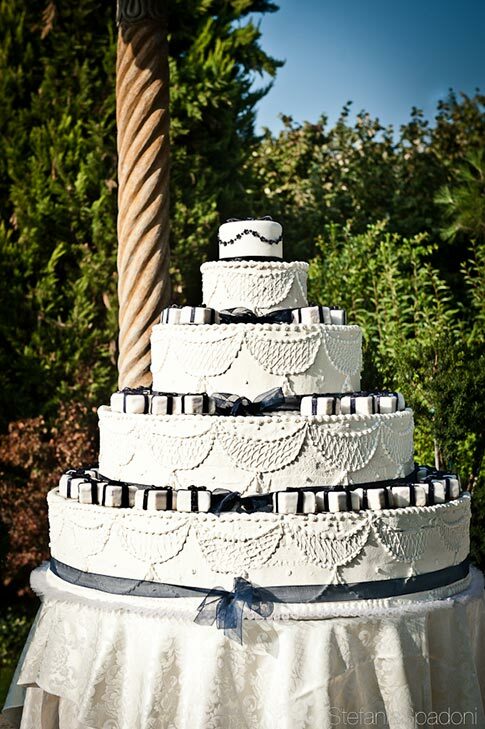 Such a nice idea to incorporate the famous something blue in her dress and details! 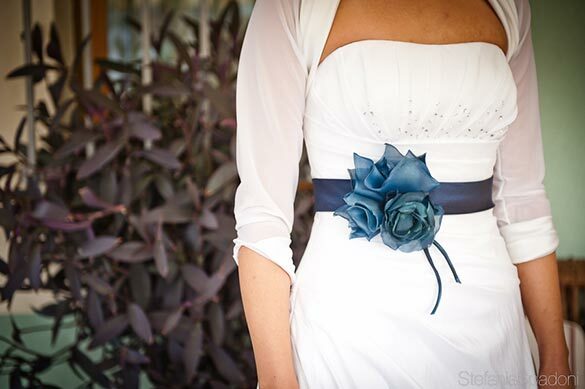 Have a look to Stefania’s dress and pretty flowered belt! 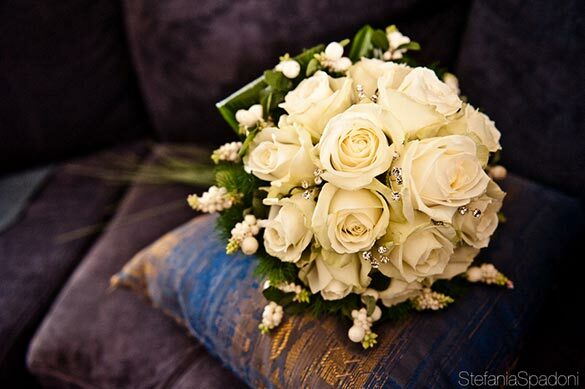 On the other hand for her floral decorations Stefania wanted all in ivory roses. 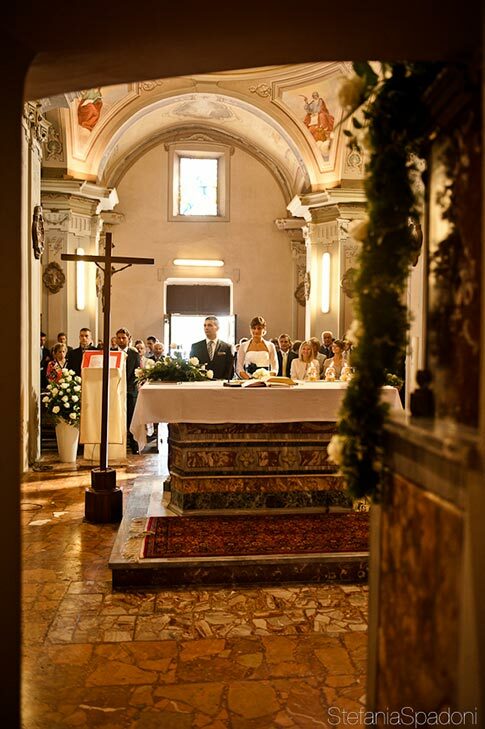 Stefania and Ivan opted for a romantic catholic ceremony in a small country church in Monticello d’Alba. 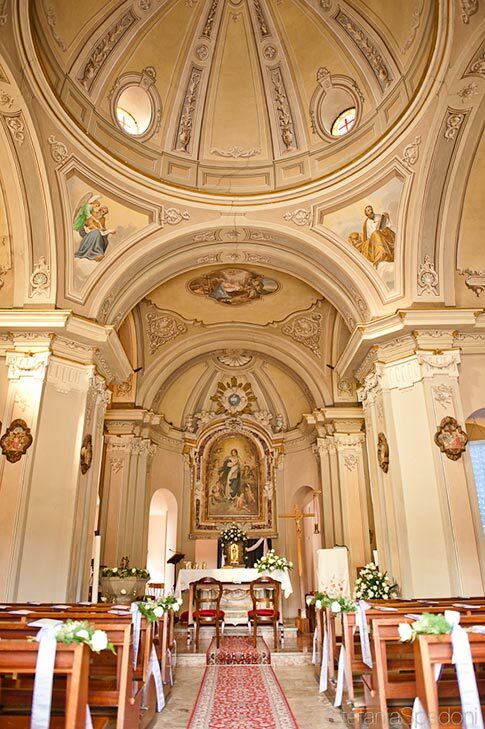 The style of the church with bricks and simple decors outside is the traditional Piemontese Baroque and has a perfect country feeling! 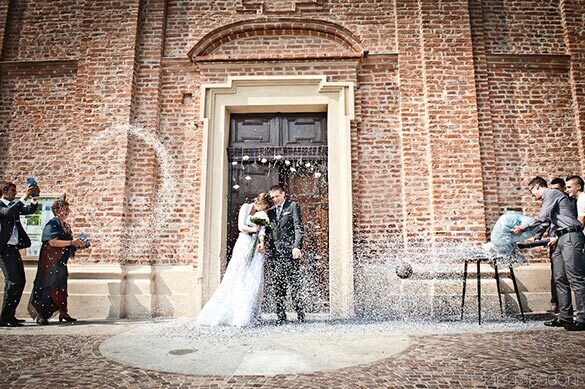 After the moving ceremony a huge storm of confetti welcomed newly weds out of the church! And after that…. to the villa on a fun vintage Wolkswagen Beetle! 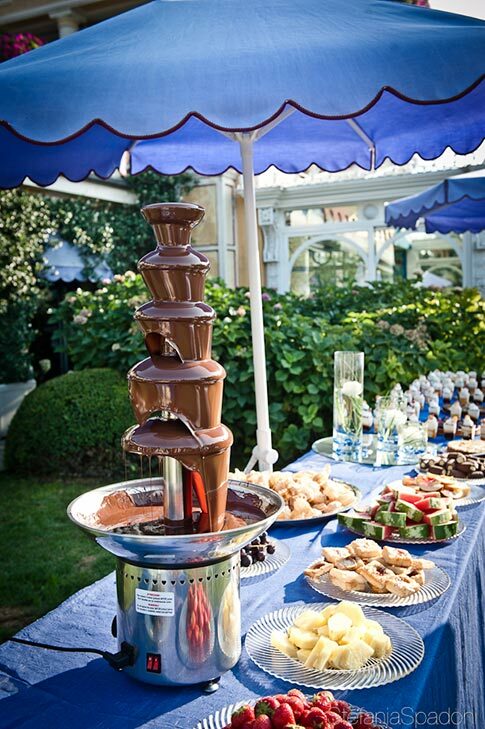 Villa is stunning as usual and a warm summer sun allowed a relaxing aperitif in the garden with bar open and a delicious chocolate fountain! 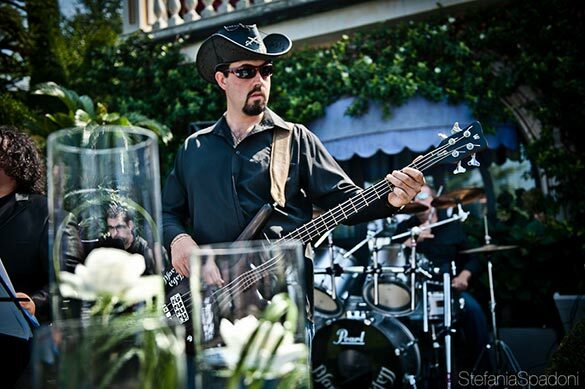 All was accompanied by a great band the same that rock the night for the dances after the reception! 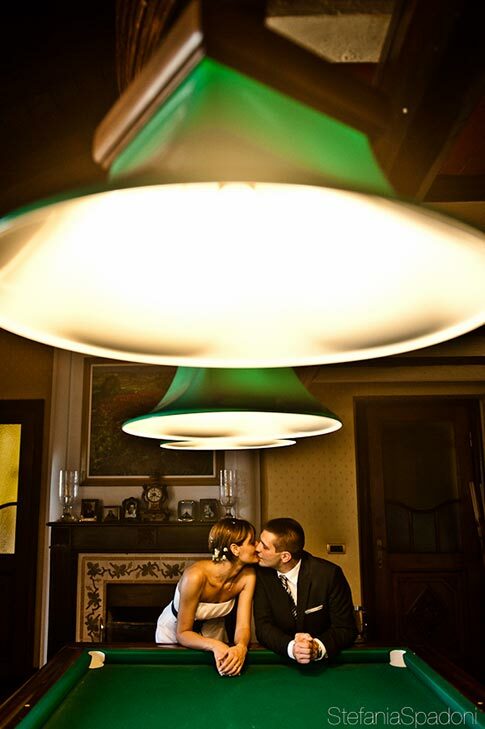 Before the reception Ivan and Stefania had the chance to take some special shots just the two of them in the rooms of the villa. 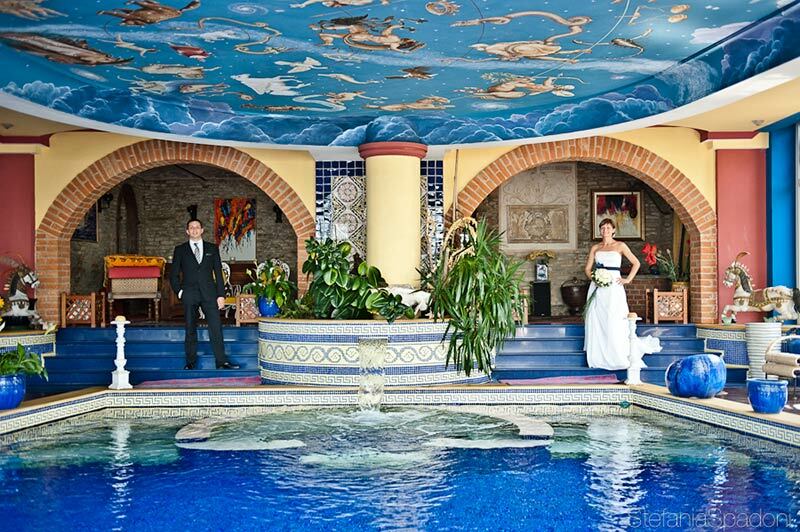 You have the occasion to see some here and appreciate the beauty of the villa indoor spaces! Seated reception was held in the stunning room. 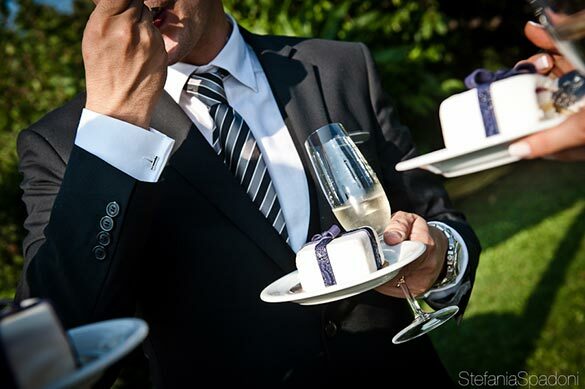 The sun is not set yet but it is time for the wedding cake… again… something blue! 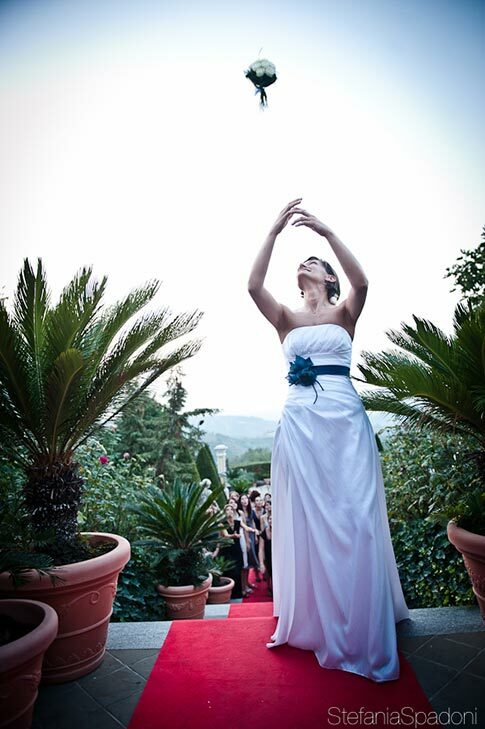 But before this the traditional throwing of the bouquet from the steps of the villa!! 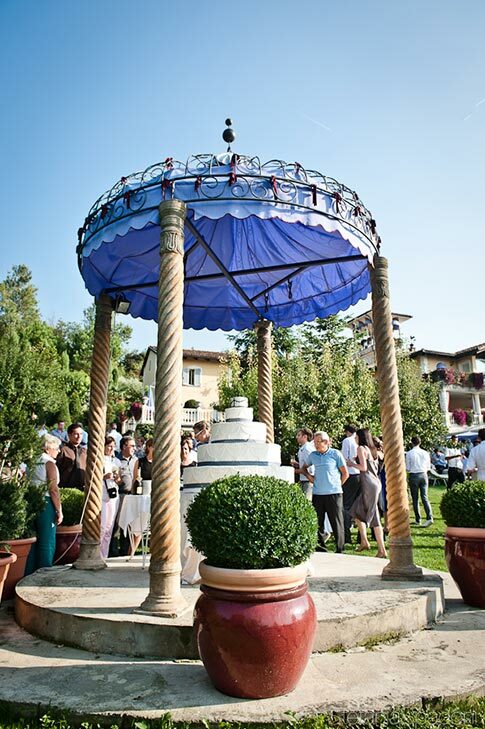 Stefania studied a stylish wedding cake to be served in the garden just by Villa scenic gazebo. 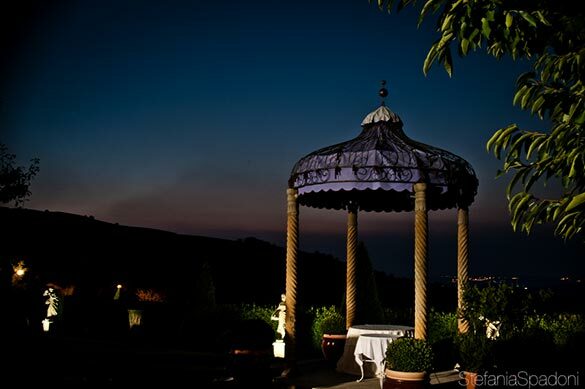 The cutting of the cake by the gazebo is a must, stunning view on the vines and relaxing atmosphere, nothing better for a special touch! 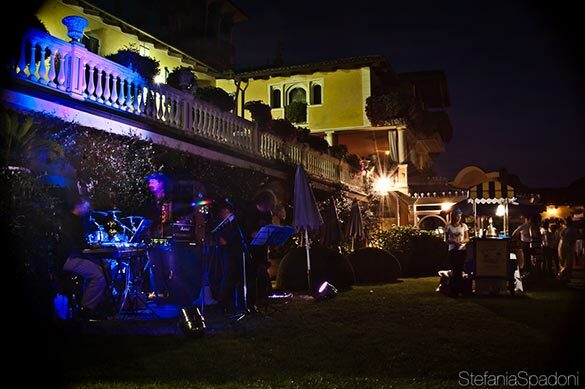 After dinner party with the band and fun dances up to late a night to close a wonderful day in Langhe. 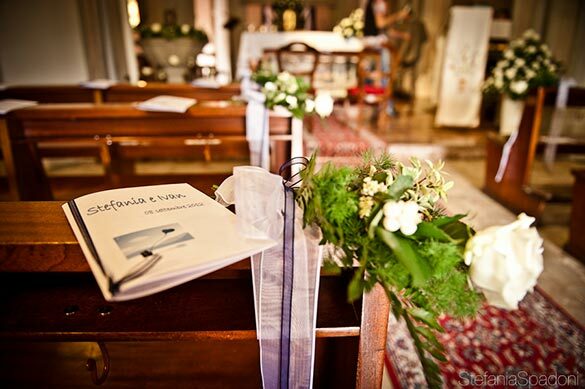 A very special thanks to Stefania Spadoni photographer who took these great shots of this magical day!